Chelsea star Eden Hazard has hinted at his motivation in seeking to leave the club for a transfer to Real Madrid. The Belgium international’s recent words will no doubt have Chelsea fans worried as he looks no closer to signing a new contract at Stamford Bridge. 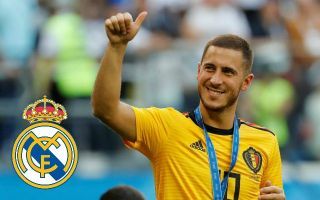 Hazard’s current deal is due to expire at the end of next season and links with Real Madrid will not go away as he heads closer to most likely being available for a reduced fee, or potentially even leaving on a free transfer if he remains at the club until 2020. The player himself is also not doing much to dampen talk of an exit from CFC, having been quoted earlier this week as admitting a move to the Bernabeu is a dream for him. When asked again about his ambitions, Hazard suggested part of the reason he’s looking to move to Spain is to give himself a better chance of winning the Ballon d’Or. Does Eden Hazard need to leave Chelsea to win the Ballon d’Or? The 27-year-old certainly can’t do that if he’s not playing in the Champions League or winning other major honours, which is not always a guarantee at Chelsea.